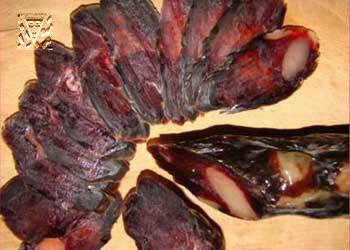 For preparation qaziliq is better to take a belly part and pulp of fresh fat beef or a horse-flesh (fresh meat well absorbs pepper and salt). Meat small to cut, to add more salt, black ground pepper and, mixing, it is good to rub in meat. The stuffing prepared thus to put in a pan, to cover with a napkin and to maintain on a cold from 15 o'clock till 1,5 days. Horse or beef guts to wash out cold water, to turn out, scratch out the slime, three-four more times to wash out cold water, again to turn out and one end to tie up by thread. To fill guts with the prepared stuffing, alternating meat and fat slices. It is necessary to consider that fat content of meat for qaziliq should make approximately 30 percent. At the big fat content the filled guts pierce in several places by needle to allow to excessive fat to flow out. Having filled guts, to tie up the open ends and to take out sausage for some days on the sun and a wind. Then for 2-2,5 months to suspend in a dark cool place for maturing. Ready qaziliq 4-5 months remain. Before giving on a table qaziliq cut the same as sausage of industrial preparation, but thicker circles to keep fat. To take a fat horse-flesh (belly), to cut on slices in 2 sm in width and 7-8 sm in length, to salt, pepper, it is good to mix and put all for two-three days on a cold. Then the processed beef guts to fill with the received stuffing, the ends to fasten and again to put on a cold (put during snow for 5-6 days in the winter). Prepared thus qaziliq suspend on an attic or in a dark place for 2-3 months for dried.